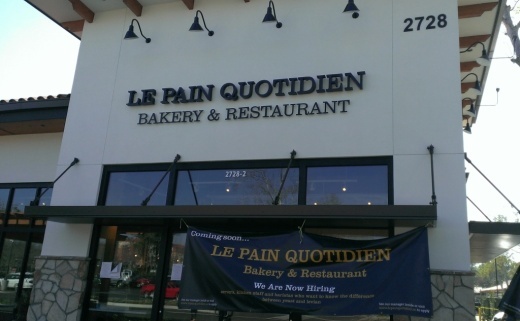 Le Pain Quotidien is opening soon opened Monday, March 2nd at the Westlake Plaza, 2728 Towngate Road, Westlake Village in a new building adjacent to Gelson's. The same building is also slated to include the Ice Cream Lab and Pressed Juicery. Founded in Brussels in 1990 by Alain Coumont, Le Pain Quotidien is a bakery and restaurant that serves simple, wholesome and sustainable food, made with organic and local ingredients whenever possible. With over 200 locations worldwide, including over 70 in the United States, Le Pain Quotidien invites guests to break bread and relax with friends and neighbors around the communal table. Some of the items you'll find on the menu include croissants, soft-boiled organic eggs, organic steel-cut oatmeal, homemade organic granola and breads, organic vegan soup, roasted turkey and avocado tartine, pole-caught tuna tartine, organic lentil and avocado salad, grilled chicken cobb salad, pastries, tarts, platters, quiche and so on. Now if you're like me, you might pronounce it "Lay Pain Quote-i-deen" and of course know well and good that that is way off. The video below demonstrates the proper pronunciation as "Luh Pan Koh-Ti-Dyan" which may prove helpful. And that's how we say it... from LePain Quotidien on Vimeo.